Taj is a gifted sin eater or aki. He's living in Kos where mages are powerful. Aki have to slayer the beasts that arise when someone has committed a sin and a mage is helping this person to get rid of it, but this costs them dearly. After the beast has been conquered a tattoo appears on the sin eater's skin. Usually the tattoos disappear again after time, but Taj is covered in them. He's seventeen years old and has seen more than most others of his age. Taj tries to send his family as much money as possible and misses them dearly. He can't go home because of what he does for a living. When Taj helps the royal family to get rid of a particularly nasty sin it turns his whole world upside down. Gone is the hard life shared with other aki making little money and he's now part of a world he'll never feel at home in. However, this is just the beginning. He's in the middle of something, a dark conspiracy he doesn't know the details of. Taj needs to find a way to deal with this problem for the safety of the people he loves and his own wellbeing. Will he succeed? Beasts Made of Night is a beautiful story filled with magic, sins and secrets. These are exactly the kind of subjects I like. Taj is brave and strong and he might be the best sin eater of his generation, but he's also powerless when it comes to those who rule his city. He has to eat sins, even though it harms him. It costs a lot of aki their sanity, but Taj is determined to keep going. I loved that strength in his character. He easily cares and his heart is kind and pure, which makes it difficult to be burdened with so many sins. That's a fantastic contradiction and a great topic for a story. I couldn't turn the pages quickly enough to find out if Taj would be able to keep himself sane or not. Tochi Onyebuchi has a gorgeous way with words. I liked the way he slowly unfolds his story, it kept me interested from beginning to end. 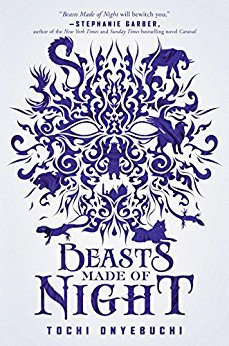 Beasts Made of Night is fantasy with Nigerian influences, which is original and surprising and it intrigued me straight away. The story is a fabulous adventure, filled with scary beasts, darkness and immorality, versus pureness and kindheartedness. I loved the combination of the two and really enjoyed reading this very special story. If you love surprising YA fantasy Beast Made of Night would be an excellent choice. Fantasy books involving sin and magic is my cup of tea. I love alternative ambientations and if there's a royal family...I'm caught! I like to read YA Fantasy and this book sounds great! It sounds really intriguing! My kind of read, thank you. I love the color scheme on this book cover! And the synopsis hooked me in so fast. 2.- it's SO refreshing that it's influenced by something other than Celtic, Norse or Christian mythology!!! What a great cover! I love it. I love books that are magical. I'm curious about those sins & secrets. Oh, this is interesting! I've heard of the stories of the Sin Eaters but never read anything about them. This seems like a unique story to me.